The Plasmaglow Thundergrille LED Auto / Truck Grille Light Kit will give your grille the custom look it needs to stand out from the crowd. The ultra-thin LED Strips mount in any grill (fits ALL cars and Trucks) with the included mounting hardware. You can wire it in with the included switch, or into your running lights so it turns on with your vehicle. The Plasmaglow Thundergrille LED Auto Grille Light Kit uses a simple 2-wire hookup that anyone can do with the detailed instructions in the box. 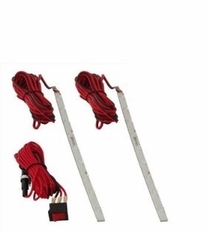 The kit includes TWO special LED strips are each 10 inches (25cm) long, flexible, and 100% waterproof. Everything you need is in the box (LED Strips, mounting hardware, instructions, wiring and switch).